It has been a busy week! 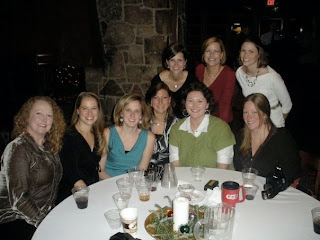 On Friday we had the Seminary Holiday Party which was lots of fun, as always. It was a fairly "calm" night as we enjoyed sitting around the tables and listening to a great jazz band while chatting with our friends. As I glanced around our ever expanding table (more and more chairs were pulled up to make room for more folks) I realized just how many great friends we have here. I love that we have great friends who have children the same age as our kids and therefore we have a lot in common. However, I also love that we are friends with people that we may have never been friends with in the "real world." We are parents of babies, toddlers, teenagers, maybe not even parents at all. We are in our 20's, 30's, 40's and 50's. We are from Texas, Georgia, Florida, Alabama, etc. We are spouses and seminarians. We are all so different, yet so alike in this seminary world. Best of all, we are FRIENDS. On Saturday morning, we attended a service in COTA that Chad organized. The kids were most excited about getting fed a constant stream of suckers to assure that they would be quiet. At one point during the service, Tucker started saying, "shake-a-booty, shake-a-booty." I tried hard not to laugh, but it was just too funny. In these pictures, he is hiding (or maybe trying to knock over) the font while everyone else enjoyed refreshments. I think Caroline was busy searching for ladybugs. This is what Caroline prefers to wear: a "princess dress" aka a "summer dress", leggings, sometimes a shirt underneath and boots. She honestly believes that this matches and looks good. It used to bother me, but not so much anymore. She feels like a princess and that's all that matters when you're 3, right?! ?